Louisville is the largest city in Kentucky and is the home of the world famous Kentucky Derby. 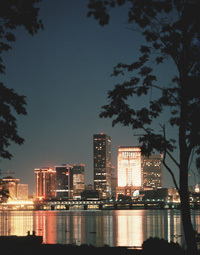 Built on the falls of the Ohio, Louisville offers visitors a wide range of sites and attractions. Some of the many places to see are Churchill Downs, H & B Bat Museum, home of the Louisville Slugger, Kentucky Fried Chicken world head quarters, Kentucky Kingdom Thrill Park, museums, historic homes, and the Louisville Zoo. Louisville has all the sites, sounds and action of a big city with the charm of a small town.